Celestial Stitches incorporates the sewing and stitchery aspects of Celestial Enterprises. It is primarily composed of Celestial Stitches Quilting which spreads the Gospel by hand embroidering Scriptures on baby, youth and adult custom designed quilts to provide comfort through the Word of God as well as physical warmth and comfort. 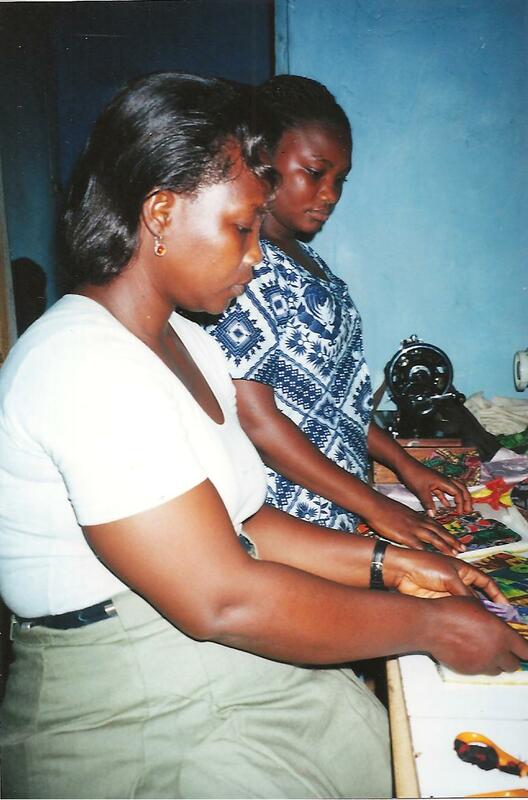 Quilting initiatives have been developed and implemented by Mariah Landrum Childs in Ghana, West Africa and here in the U.S. to teach women the art of quilting and to help empower them through socializing and networking opportunities to become economically elevated through the sales oftheir quilts. In 1999, Ms. Childs established a NGO in Accra, Ghana, West Africa, The Celestial Needy Children's Program, with a native Ghananian, Kwabena Osei Bonsu. It's initial income generating iniative was The Celestial Heritage Quilting Project with a mission to teach disadvantaged youth and young women the art of quilting to make quilts and other quilted products out of disgarded African batik textile remenants to help empower them economically. The revenue that was obtained from the sales of the batik quilted producs that were exported to Ms. Childs were wired to The Celestial Needy Children's Program in Ghana, under the directorship of Mr. Bonsu. The funds were distributed by him to provide wages to the workers, school uniforms to the youth, as well as school supplies and other necessities. Below top picture with Mr. Bonsu to the left, Ms. Childs in the middle, Mr. Bonsu's cousin to the right, and young women quilters in the foreground. Lower picture shows young women from Madina, outside Accra, Ghana, West Africa with a quilt they completed with Ms. Childs to far right. Ms. Childs taught weekly quilting classes on Tuesdays and Thursdays at the Wesley Community Center in Savannah, GA for 5 years. 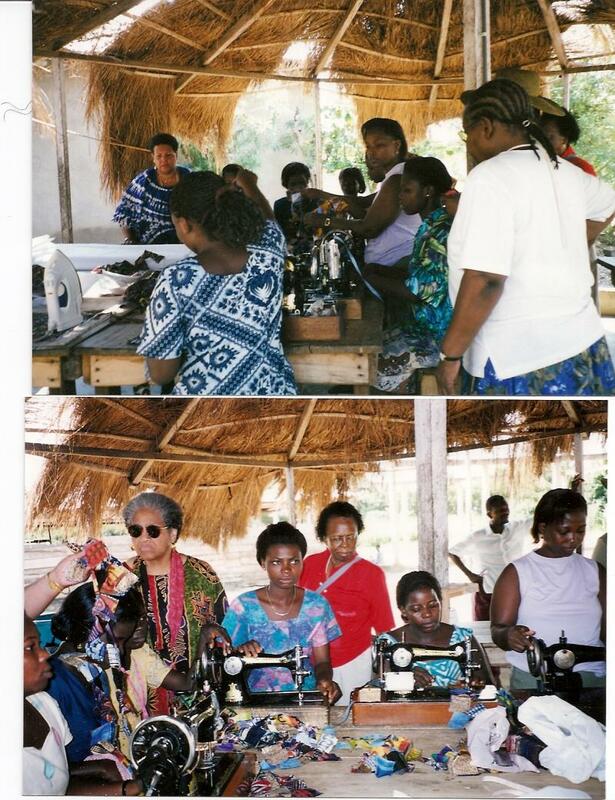 One of the highlights was taking a group of senior quilters to Ghana to "compare quilting techniques" with women in Ghana, West Africa in July 2001. Savannah Ms. Childs top picture rear left with Wesley Southern African American Quilters in Madina, a village outside Accra, Ghana, West Africa. Ellen, in the foreground in Madina, teaching a teen girl how to stitch together batik squares to form a patchwork quilt top. 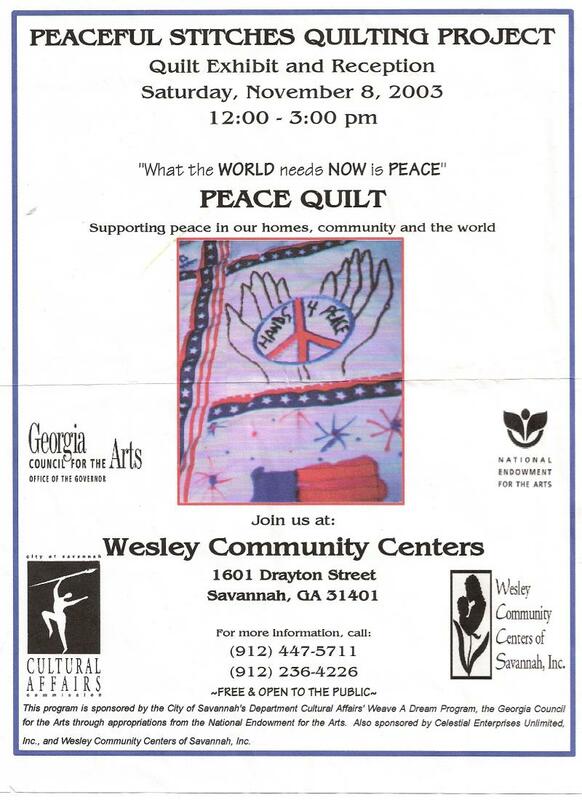 Many quilting projects have been initiated and funded by the City of Savannah Department of Cultural Affairs and the National Endowment for the Arts to increase community consciousness and awareness such as: the Quilt of Peace that was created to remember family members and friends in combat; the Precious Memories Quilt that was created to give grieving parents a keepsake to remember their deceased children in Savannah, GA; and the HIV/AIDS Quilt of Hope that was created to promote public awareness about the disease in Winston-Salem, NC and Atlanta, GA. 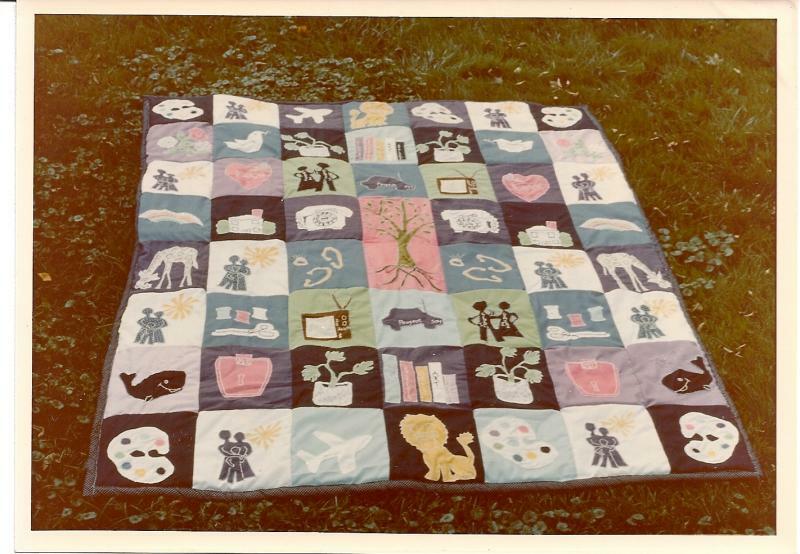 In 2006, Ms. Childs sponsored a quilt drive initiative and collected over 50 quilts, which she and women quilters from Georgia, North Carolina, and New York quilted for AIDS orphans. She hand carried them to South Africa and Swaziland to be a blessing and to comfort AIDS orphans during the winter season. 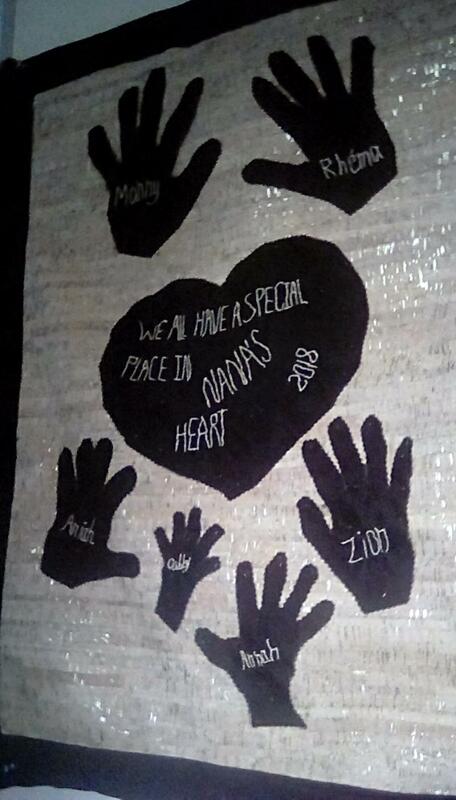 Children reveived quilts in Zululand and Cape Town, SA and Swaziland. 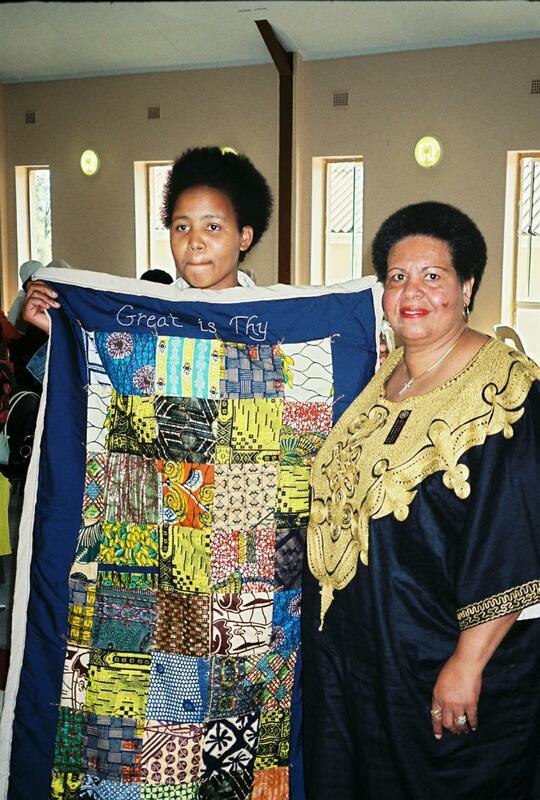 Below Ms. Childs is shown with an AIDS orphan, referred to as a Distinguished Child, at the Empangeni Methodist Church in Zululand, SA holding a quilt made by Ms. Childs from Ghananian Batik fabric. 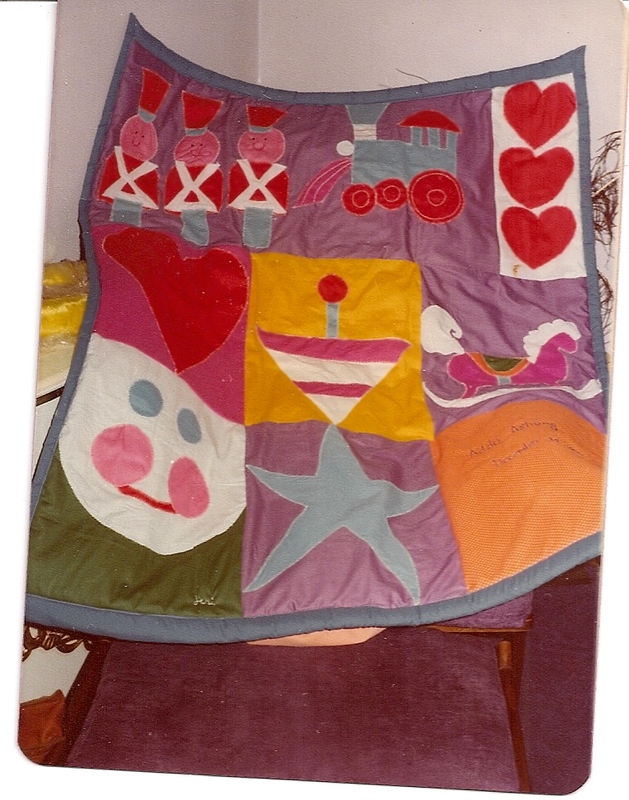 Go to Missions Page to view other pictures of children with the donated quilts. 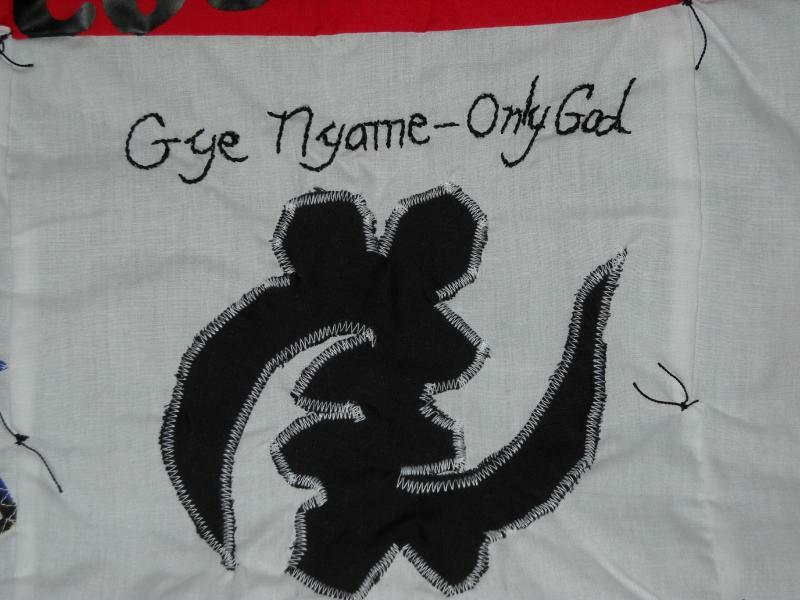 Customized bed quilts are avaiable for babies, youth and adults with hand embroidered scriptual verses, names, and appliqued designs. Color coordinated to match bedrooms. Wall hangings designed to give any room a decorator's divine touch. Perfect for weddings, baby showers, anniversaries and birthdays. Timelines vary depending on order specifications. Prices vary. "Stitching love and beauty into each quilted item we design"
For more information contact Mariah Childs at 1-470-504-0471 or celestialeu@gmail.com. A quilt is special! It brings warmth on a cold night, shelter from the sun on a hot day. It becomes a bed, a room divider, a backpack to carry belongings, and at times even a home. After a haitus from Quilting, in April 2018, Celestial Stitches, began operating again with a New Vision. 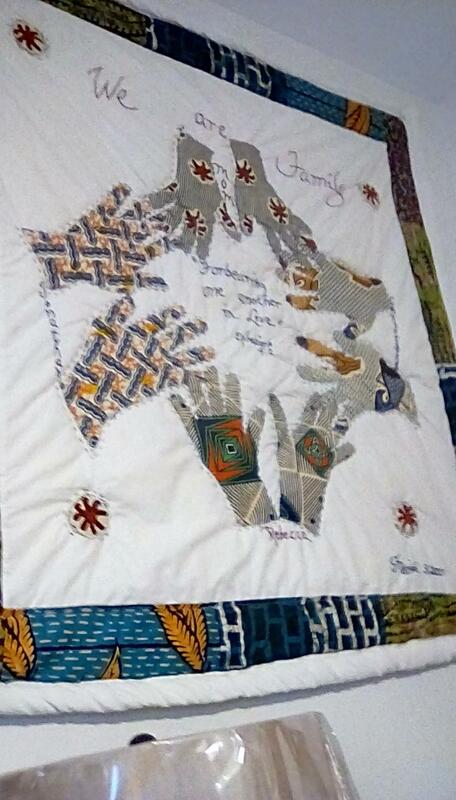 QUILTS by MARIAH will feature Custom Designed Quilts and Wall Hangings with an EMPHASIS on incorporating "HANDS" of Family Members, Friends as KEEPSAKE Wall Hangings and Quilts Symbolizing "UNITY." 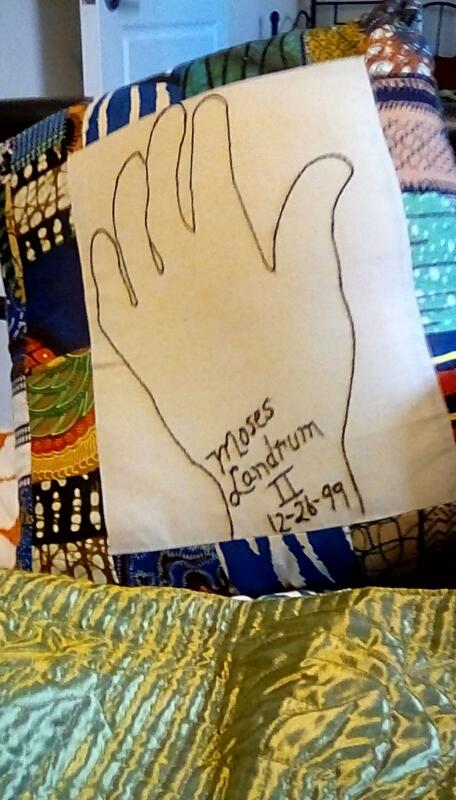 Celestial Stitches will continue to provide CUSTOM DESIGNED Quilts and Wall Hangings for ALL OCCASIONS: Births, Dedications, Anniversaries and Birthdays with Hand Embroidered details, Scriptures and Sentiments. *PRICES will VARY depending on SIZE and DETAILS incorporated in the DESIGN of the Quilt or Wall Hanging. *A NON-REFUNDABLE FEE of 50% of the Total price is REQUIRED when a CUSTOM ORDER is PLACED to COVER the COST of DESIGNING and MATERIALS. The BALANCE will be DUE upon COMPLETION. There are many times in our lives when the winds of challenge cause us to shiver and shake under the turbulence. We may feel isolated and cold. We may look for something to comfort us, and to take away the chill. One may reach for the telephone to call a friend; listen to a favorite song; or reach for an old familar patchwork quilt. For under its quilted layers, there is warmth and comfort. Many times it seems that in spite of our best attepmts, no solution to a problem seems at hand, no answer to prayer has come forth; or the answer we receive leaves us dishearted. In times like these, sometimes comfort and refuge can be found by snuggling underneath a favorite quilt which gives one a comforting sense of security. Spiritually, the Holy Spirit, like a quilt, is a Comforter. He covers us; helps to heal our wounded spirits; and eases the emotional turmoil that may afflict us. The Holy Spirit protects us from confusing thoughts by wrapping us soundly with the Word of God to give us hope and peace. 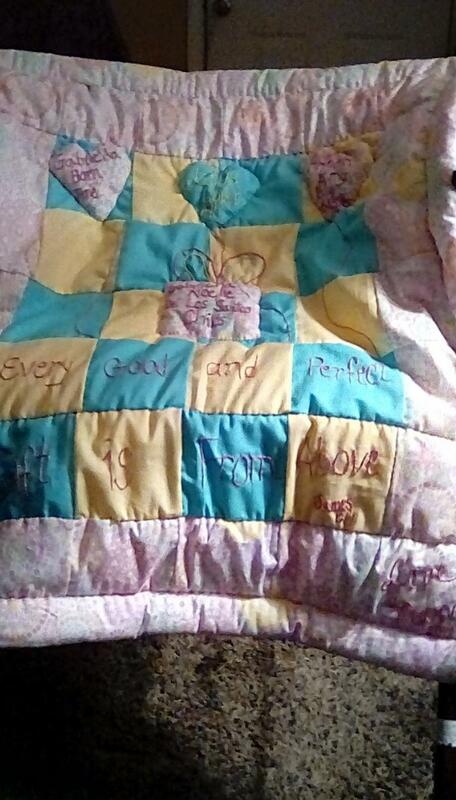 The quilt is a comforter with its worn patches, that symbolically represent the trials, victories, joys and sorrows that we have experienced in our lives. Wrapping up inside its layers may temporarily make us feel safe and secure. However, the only lasting comfort and security can be found through the loving grace extended to us by the Holy Spirit, the real Comforter.